In terms of speed, note the lack of any spooky “unprecedented” retreat. The glaciers are shorter now, but the rate they are shortening is slower than in 1870. See this longer graph — the red line estimate of summer temperature bottoms twice in 1600 and 1810 which also coincides with volcanic activity and solar minima. It could get pretty expensive to control glacier length since we have to reduce the suns activity and probably set off some nukes in lieu of a handy volcano. Analysis of ice cores delivers continuous data for the first time on industrial soot from 1740 to today. In the first half of the 19th century, a series of large volcanic eruptions in the tropics led to a temporary global cooling of Earth’s climate. It was a natural process that caused Alpine glaciers to grow and subsequently recede again during the final phase of the so-called Little Ice Age. This has now been proven by PSI researchers, on the basis of ice cores. Up to now, it was hypothesised that industrial soot in the second half of the 19th century had triggered the rapid melting of glaciers occurring at that time. The first-ever analysis of the amount of soot (also called black carbon) locked in the ice and thus historically archived now contradicts this assumption. The resulting continuous timeseries of soot concentrations will, in addition, help researchers in the future to improve climate model simulations by enabling them to use experimental data. The results were published today in the scientific journal The Cryosphere. Most of the glacier retreat had already happened from 1850 — 1875 before man-made industrial soot became significant. rBC = refractory Black Carbon. M. Sigl, N. J. Abram, J. Gabrieli, T. M. Jenk, D. Osmont, M. Schwikowski (2018) 19th century glacier retreat in the Alps preceded the emergence of industrial black carbon deposition on high-alpine glaciers, The Cryosphere, 16 October 2018 (online) DOI: 10.5194/tc-12-3311-2018. And yet another paper proving the point that we are not in pre-industrial conditions. As you both know the LIA had come to an end in Europe by around 1850 and then the strong El Nino of 1878 sent temperatures through the roof. I believe the strong 2019 El Nino predicted by Ian Wilson will have a similar impact, followed by a sharp decline in world temperatures. Fat chance, but for your edification the Alps were ice free during the MWP. Oh know… Otzi must have been found in time, kept frozen in someone’s freezer, then returned to the ice once it reformed. Don’t be embarrassed, we all make mistakes. and was frozen, uninterrupted in the alps, until recently. You know where Tyrrol is right? In Bolzano, but that is hardly the point, he died 5,300 years ago in early summer, what does that tell us? he was in a frozen glacier undisturbed including during a period when you said there were no glaciers. He was speared in the back, fell into a ditch and died within minutes at the end of the Holocene Max. It was a cold wet summer and conditions didn’t improve much from then on. Even though the Roman Warm Period and Medieval Warm Period were warmer than now, the body was already mummified and avoided the attention of scavengers high in the Alps. that is a complete fiction el G.
Had a look at the details of his location. It seems that he was located at 10,500 ft. Whether he went down in winter or summer probably wouldn’t make much difference,: it would be cold and he could be well preserved. Having been to the restaurant up on the Eiger, Monch , Jungfrau complex at about 14,000 ft I can tell you there is limited time outside. look at the graph entitled “Long glaciers coincide with the solar minima and with volcanic forcing:” In there notice that all the glaciers are moving in concert until around 1860 or so, then they go crazy. Then look at Figure 7, where the Black carbon inputs are shown, with a change around 1870. Do you see what I mean? It might be a coincidence, similar to the warming of late last century caused by an over active sun, but 97% of scientists claim human induced carbon dioxide was responsible. Yep, correlation is not causation – but my original point remains about the change observable in the industrial age. Mt. Blanc (the Mer de Glace) started melting in 1838. Other glaciers in middle Europe started melting in the 1850′s and had made major melting by 1869. And I saw recently that the temperature figures for 1850-1870 have been “adjusted” to show slight cooling. So he’s supposed to be telepathic? Really GA. If you wanted elaboration, why didn’t you just—politely—ask? I still don’t know what Peter F meant by that. No, but I gained considerable knowledge out of the debate. At present I couldn’t give a dying duck about the climate. We are living in a construction zone at our local beach where every free-standing house is being demolished and rebuilt as a duplex. I suppose duplex is better than a 10-storey block, but we have a 30mx6mx 3m trench in front of our house, where engineers are trying to find old sewer lines from 1903, for which there are no records. At least we have no passing traffic at night, as the road is closed and likely will be into 2019. Coal was being burned long before late 1800s. At some point we will get a tech-savvy politician who has the ability to sift out the climate behaviour facts from the interest-group-driven drivel that most of our media present as climate fact. Unfortunately by the time such a politician emerges as a leader our industry and economy will be on its knees. The only faint glimmer of hope I see is that Morrison could be sending Turnbull to Bali in the expectation that Turnbull will agree to something ridiculous which will give Morrison the opportunity to reject it outright using the excuse that Turnbull has just reinforced the message that he no longer has Oz’s best interests at heart. I don’t often bother reading rhetorical drivel but I was logged on early in a thread and read it. Seriously, this is drivel. Slimy thick barmy drivel. You are saying that we will get some sort of person you want but you know it will be too late when we get them. Not only are you claiming an answer to your problem that has no basis or reason to think will help, but you are predicting that the timing of this person will be too late. Well if you study history that’s exactly what eventually happens when a nation goes through anything from a rough patch. The only exception is when a nation collapses. Examples of the latter include the Greek, Roman, Babylonian and many others. Of course you might be thinking we are not going through a rough patch at all. In that case you must be so wealthy you don’t give a damn, just like many Wentworth voters. No economic prosperity, no high standard of living sustainable. Indeed, except by those who have so much money they don’t give a damn. In that case they would likely say it’s the economy, stupid peasants. Yes, it’s quite strange that Morrison would send the Turncoat to Bali for “climate change”. Sort of like, a sick joke, something like Trump consulting Al Gore just after his election…then pulling out of Paris. I’m quite pleased about this by-election…it’s pull out of Paris or die, for Morrison and the Libs. Watch for Barnaby Joyce come out of left field. What next, an elected Shorten Labor government sending union delegate citizens to represent the government? A report involving WA scientists to help governments around the world tackle climate change will be presented at a public conference at The University of Western Australia on Thursday 1 November. Compiled by more than 90 researchers across 40 countries, including WA researchers from The University of Western Australia, Curtin University and Murdoch University, the Intergovernmental Panel on Climate Change [IPCC] Special Report on Global Warming of 1.5°C examines the impact of global warming and possible solutions. It was prepared in response to a request from the United Nations Framework Convention on Climate Change (UNFCCC) when it adopted the Paris Agreement in 2015. The conference is open to the public with no charge to attend but registration (LINK) is essential. Doctor Bill Lindqvist wanted to test out the Intergovernmental Panel on Climate Change’s vetting processes. He applied to sit on their expert panel three years ago and was shocked by their response. Dr Lindqvist has a Bachelor of Science and a Ph.D in mining geology, but he hasn’t published any papers or research on climate science. Apparently, that didn’t matter to the international climate body. “I just did it for a lark,” Dr Lindqvist tells Alan Jones. “I received a formal invite after my application was accepted to become an expert reviewer. “I never followed it up because I had better things to do. Dr Lindqvist says he can’t believe how slack their vetting process was. Pat, Dr Neville Ellis has a degree in Psychology and a PhD in Sustainability Studies. I’m not sure that either of those degrees provide any theoretical background to climate science. He may be an academic, but does he qualify as a scientist? So why was he even participating? Yes, Donna Laframboise nailed that to the wall over and over again in her 2011 book “The Delinquent Teenager Who Was Mistaken for the World’s Top Climate Expert” Reading that book would be good for everyone: it leaves it’s reader in no doubts at all about the depth, breadth and the awesome, sheer breath-taking incompetence of its subject, the Institute of Propaganda for Climate Catastrophe [IPCC]. Obtaining and reading the book gives great clarity to the hoax. The process, science it ain’t. Step 1: Experts write a report. … and you’re being so civil, courteous and polite about that, too! I’m impressed by your restraint. I think I would surrender early to the impulse to sharpen my tongue about the commission and execution of such cozenage as the IPCC serves the world, calling it the covin it is, and add other less and less civil ad-homs as I warmed to it. They are split. Those who make their living from it are in favor of it. Those who do not, cannot see the problem. The first group have degrees like ecologist, climate scientist, master of climate Change, environmental economic & Policy, environmental management, sustainable development etc. The others have degrees like physics, chemistry, geology and meteorology. The first group also includes psychologists. The consensus is to a large extent true. Ask climate scientists if they believe that a significant part of global warming since 1800 is human caused, most likely 97% of would say it is true. Find any academic subject where a particular world-view dominates the subject and activism is the main motivation for study. Then ask a banal question of the academics in the discipline where a negative answer is basically an admission that they are wasting their lives, and you will get a similar answer. The problem for the climate consensus, is that banal opinions say nothing about whether CO2 emissions cause significant warming, or whether it is possible control global emissions. One method is to endeavor to treat all evidence, for or against on an equal basis. The evidence of Alpine glaciers suggests CO2 has very little or no effect on Alpine temperatures. A more indirect method is to look at the arguments presented. If after three decades and billions of dollars of research the climate alarmists have resort to meaningless opinions surveys as the main plank of promoting their cause, it should be a good indication of the emptiness of their arguments. Dana’s mind is the only thing which is divided with a 97% consensus on everything he wants a 97% consensus on. It can’t be any higher because that’s as far as his compartmentalization can count. Only an oil field technician with no science training who seems to have elevated himself to the rank of “ Klimate Scientist” could possibly continue pushing the absurdity of a scientific consensus.. I have to wonder if he would also vote for the banning of two very common chemicals in our environment: Dihydrogen Monoxide and it’s close cousin Oxygen DiHydride. They both cause death if treated disrespectfully. Thanks for this post..Very interesting. 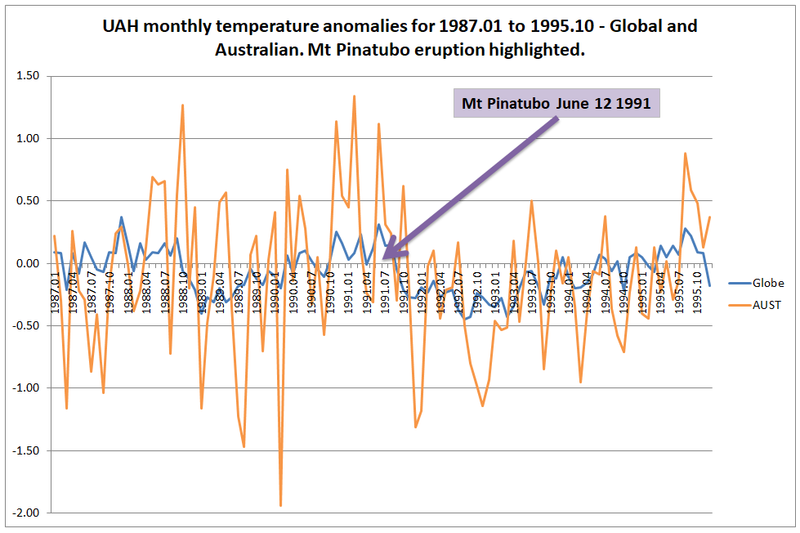 I think Mt Pinatubo ( Philippines) blew it’s stack very powerfully in 1993..I remember reading at the time that it caused a global cooling..And that seems to be reflected in the chart around 1993..Where suddenly the rate of glacier melting drops off …dramatically.. I read the post about vulcanism posted here earlier this year..40,000 volcanoes on the planet and an awful lot of them under the seas and not monitored..So the planet is pumping out a lot of heat all the time..
It’s not just sunlight that has an impact on the temperature of the earth’s surface. The theories of volcanic activity affecting earth’s albedo are interesting, if you or anyone else have any links to good research done on this I’d appreciate it. I find it difficult to envisage soot particles spread throughout the atmosphere for ‘X’ amount of time could have such an impact but would like to know otherwise. I have charted the UAH monthly temperature anomalies for the period 1987 to 1995, for both the Global and Australian estimates. Mt Pinatubo erupted on June 12 1991. The Global anomaly was at a peak of +0.31 in June 1991 then fell to -0.28 in December and bottomed out at -0.45 in the August 1992. The anomaly did not exceed +0.30 again until January 1998 with the onset of the natural El Nino. For the NH land anomaly the drop is more dramatic. June 1991 +0.30, Dec 1991 -0.32, July 1992 -0.80. Question, was the PSI looking for radiative atmospheric black carbon but found refractory black carbon? This can’t be a simple confusion of CO2 with C, can it? Or at least have their progress delayed. You just wonder. If the Greens were a political force 10,000 years ago, whether they would have campaigned to stop the end of the last ice age? We are talking about a time when agriculture, the burnt stick, the plough and the wheel were invented. Oh, the humanity. It should have all been stopped. If only we had the wisdom of Al Gore then. Al Gore would have been sitting in the ice staring at the burnt stick and muttering “Hockey….hockey…” to himself. The only times I’ve seen evidence from scientific sources that imply CO2 correlate well with global temperatures is when they CO2 changes actually lag behind the global temperatures changes by hundreds of years. This includes the graph Al Gore shows in his infamous talks but he keeps conning the audience by saying it was the other way around and without mentioning the long time lag. Yes. The sooner they can stop observing and start dramatizing the better. You keep on observing you’ll never get to the end. I mean, the discoveries of sub-glacial and sub-marine volcanism, active and inert, could just go on forever. And what’s under all that? You see what I mean…They’d never have made Gone With the Wind if they’d had to get every detail of old Atlanta right. At some point you have to shout “Roll!”. Since that lusciously studio-lit Tesla in space we’re all agog for convincing visuals. As the dentist on the toothpaste ad says: We’ve seen the science and we’re convinced. Improve climate model simulations? Surely not – how can you improve on something that we are told is settled! And when it’s all boiled down, as far as the Earth is concerned these glacial fluctuations are Very minor changes compared with the big ones 25,000 years ago. At that point the one mile deep ice field covering New York Central park and the location of the U.N. Building was firmly in place and didn’t look like melting, but it did , eventually. All of the current hoo haa about climate variation needs to be brought into perspective and viewed with the aid of the world’s Only, Proven and Continuing Climate Model. It is also worth noting that the global average temperature anomaly was also meaningless in the context of the ice age. I believe that its is estimated the global average temperature was about 7-10C lower than today. That is about 4-7C instead of 14C. Where I live in Northern England average temperatures are about the global average, but 20,000 years ago the area was covered by an ice sheet 1km or more in depth. I would guess that the annual average temperature was well below zero. That is at least 15C below today. The same is true for much of the rest of Northern Europe, most of Russia, Canada and Northern USA. By implication, the tropics and much of the Southern Hemisphere had average temperatures within 7C of today’s average. Good news everybody: ‘Hot Weather Coming To An End’. What!? Has Obama’s Dream finally come true? Has NZ’s ban on plastic bags saved the universe at last? Read on: ‘Warm spring weather… is about to give way to… cold temperatures… 24˚C today [dropping] to 12˚C tomorrow’. Nice and balmy today in NZ..Bit colder tomorrow. Well it’s nice and balmy today in Adelaide at 23C after a frost last night at my Hills home..
but BOm promises that it will stay in the 20′s till next week..Ummmm ! I think I prefer the warm Spring weather..Completely over the cold frosty nights of this dry Winter here..
Bing on some warming Hughie ! Greg,sorry that’s an ABC “story’…Best not to believe what the ABC says without verification and even evidence ! Yes Greg, even in just that little item you linked, they manage to subtly squeeze in their warming propaganda…”….getting temperatures as high as 9deg C warmer than average for October”. You’ll never hear them say “…temperatures colder than average for October”. Mack, they’re the equivalent of your ABC, the state-funded broadcaster, which employs young, keen, green repeaters – oops, I mean reporters. The same outfit recently interviewed Prof Paul Kench, NZ reefologist (? ), who’s shown that Pacific islands and atolls adapt and, hence, aren’t about to go under any time soon. The interviewer was horrified at this man’s non-belief in an anthropogenic cause. Everything is coloured by their rose-tinted man-made-tainted glasses. Yep those darned minimums get in the way of allot of propaganda. In the summer of 1790 it was noted by Beethoven that Vienna had little ice cream during that very hot summer. This was due to very little ice being deposited on the mountains thereabouts during previous warm winter. Willie Soon quotes a transcript of Beethoven’s letter in his video Beethoven’s Ice Cream, Tolstoy’s Fire, Happer’s Picosecond Pedestal—and Climate Willie Soon, PhD (HERE) at about 5 minutes into the video, and shows the temperature record from that time. Beethoven, one of the worlds supreme geniuses and probably outmatched in music by no one. And that he was almost totally deaf before he did some of his best work is no small achievement. Only Mozart comes close to Beethoven. Interesting that he probably liked ice cream. He and I have that little quirk in common and it’s about the only thing we have in common. Oh! One other thing, he wrote the worlds best music and I love to listen to it. So you might stretch the point and say we have something besides ice cream in common — almost but not quite. I think so too Roy. Indeed, I think his choral symphony spoke of things way beyond us and takes us to places we are not able to describe…his last testimony. Glad to know he liked ice-cream! There was still plenty of ice on the Mer de Glace when we last saw it, from the top of L’Aiguille du Midi. Beethoven’s musical vision was so grand and sweeping that I have thought it couldn’t be constrained by Earth. His was a huge vision and his life could never be long enough to finish expressing it. I would hate to be without others, Mozart, Brahms, Dvorak’s 9th symphony is a masterpiece, then Saint Saens’ organ symphony, many more. But if there could only be one composer I would go for Beethoven. The shame about Mozart was that he had barely hit his real maturity, his peak as a composter, when he died. We are indeed blessed that Beethoven was able to produce for longer. One only has to listen to his grand 9th Symphony to understand the reason Sony set it’s length as the capacity of the digital Compact Disc. My favorite Beethoven work is probably because I also like the piano. So to me the fifth concerto, “Emperor,” shines brighter than all the rest by enough margin that I play it more often than anything else. But as I said, he had a musical vision far bigger than his lifetime could allow him to express. I can only guess at his fear and disappointment as his deafness progressed. It must have torn him apart inside. And to think that he started out to imitate Mozart, at least according to his early work and we would never have known what he had in him if he hadn’t found himself. He certainly must ave known about Mozart but there’s apparently no evidence that they ever met. His 9th would not be the first work that had to be made to fit the length of the recording medium. 78 RPM vinyl (only it wasn’t vinyl, at least so I’ve been told) comes to mind. Otherwise it could not have been recorded. I have a large Beethoven collection on the Telarc label. When CDs came along I bought one of the first players available in this country and started indiscriminately buying without regard to the label. But I soon discovered that if I put on just any old thing I would tire of it quickly and pull out something from Telarc. The difference was like night and day. And the difference was simple. Humans have just two ears and Telarc would cover a whole symphony orchestra with just two microphones. Others used multiple mics and the resulting mix is a confusion of sound that Telarc didn’t have. I soon stopped buying anything but Telarc. Telarc long ago abandoned classical music as the market for it dried up and they now produce small ensembles and jazz for the most part. But if you can find Beethoven on a Telarc disk, even if used, buy it and listen to it. The music will come to life. Now I have my own hearing loss that keeps the music from sounding the way I remember it. I still put on my favorite music. But it’s much harder to enjoy as I begin to realize what Beethoven went through. Amd now I’ve written another book no one will care about but me. So I better quit and go eat breakfast. I’m doubtful that the Beethoven 9th was chosen as the capacity of the CD. Different orchestras will play it at a slightly different speed, tempo if you prefer. My research into the origin decisions about the CD says that the decision to start from the inside and read out was to allow disks to be made in varying sizes, in fact when most decisions had been made the actual diameter had not been established but if there was a known starting point then the actual diameter didn’t matter that much as long as a maximum was finally established so players could accommodate the largest. And I have a smaller disk, 4 inches, the only one in my collection, that contains just the best 4 of Johnny Cash’s early stuff on it, stuff from his years on the Sun label. It’s accommodated without trouble by my recent combo Blu-ray player with a disk tray indentation exactly fitting and centering it. Sony and Philips were very careful with the red book specification that as far a I know, every manufacturer has to march to to this day. Mozart was prolific and his output was considerable in spite of his early death. So we have a lot of his work to enjoy. I’ll have to admit that I never did an ongoing rigorous search for temperature records made at the bottom of glaciers. Likewise for Mt. Kilimanjaro where so much has been made in the past of the receding snow line. I never saw anyone record the temperature on top through the year and that always seemed like the important thing to know if you wanted to understand the receding snow line. Ice and snow will disappear without ever going above freezing if the humidity is low. Just put an ice cube in your frost free freezer for a while and you’ll see whatI mean. So I always wondered if the disappearance of a glacier isn’t as much from sublimation when there’s not enough precipitation at the top to keep it going as it is from melting at the bottom. Maybe there’s someone out there who can tell me if I’m onto something or stuck way out on a limb? The NZ South Is glaciers Fox and Franz were seen from sea by Cook (1760s). From memory the LIA finished later in the 19th century in the Southern Hemisphere and there is probably a good reason for that, there were lots of icebergs in the southern ocean. That’s around the period England was building its railway network closely followed by Europe. So if the numbers of coal-fired steam locomotives constructed from then on grew in leaps and bounds, what chance did the glaciers have? And that can be followed up by sundry other papers about the effects on modern climate such as Effects of Excursion Trips by Preserved Steam Locomotives Effects on Temperature Acceleration. There’s room for two papers there: one for each hemisphere, and a third one “Quantifying” those effects. Then they can consider the rise and proliferation of SUVs … There’s lots of pseudo-science mining potential there, too!